I received a slew of emails about the guest blog that I published last Friday written by D.J. Jaffe, whose name has been popping up regularly in the media, most often in support of Rep. Tim Murphy’s Helping Families In Mental Health Crisis Act. Gabe Howard, a mental illness advocate, speaker and blogger, who has been diagnosed with bipolar and anxiety disorders, asked if I would print a rebuttal by him. Of all the comments, both in support and opposed to Mr. Jaffe’s guest blog, I felt Mr. Howard’s were the most worth sharing. Arguments about such important issues as involuntary commitment, dangerousness, and recovery can go-on-on. I will let Mr. Jaffe and Mr. Howard continue future debates between them on their own websites. I wish to thank them both for sharing their different points of view here and their efforts to improve our mental health system. While I am certain that some believe this, it is not the consensus of mainstream advocacy groups. I agree that mental illness and violence are linked. 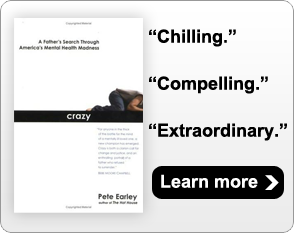 The debate centers around which people with mental illness are violent. Mr. Jaffe removes from the equation the non-violent people with mental illness, making it is easy to come to his conclusion. According to the SAMHSA study Mr. Jaffe cites, concerns related to stigma were selected by 27.5% of respondents as reasons for not receiving care. That’s more than one in four, which is a pretty significant number. If stigma is as much of a non-issue as Mr. Jaffe would have us believe, why do we mental health advocates even exist? While I am certain that some believe so, this is also not a view held by any mainstream mental illness advocacy movement. Hospitals will always be necessary. So will community services. But I advocate for the creation of a system in which the mentally ill are cared for from start to finish, which means creating an intermediate level of care, less restrictive and expensive than inpatient hospitalization but more intensive than outpatient community services. The addition of this level of care could play a major role in reducing hospitals’ high readmission rates. Of the ten sources Mr. Jaffe cites to prove his claims that assisted outpatient treatment (AOT) reduces arrests, suicides, hospitalization, and violence, nine of them compared people who received AOT to people who received no treatment at all. Obviously, any treatment is better than none, whether involuntary or not. Further, Mr. Jaffe states that 81% of the people enrolled in AOT retrospectively said it helped them “get well and stay well.” This figure is drawn from interviews with 76 AOT recipients in New York City. The page of Mr. Jaffe’s website asserting this has a variety of numbers and quotes pulled out of context from several different studies, reports, and interviews. As an example, one of the studies Mr. Jaffe cited in his blog was conducted in London, where the laws on forced treatment are very different. In this study, 115 people were admitted to the hospital who “lacked capacity” to make treatment decisions on their own behalf. At the end of the study period, only 35 of those individuals had “regained capacity” and all were still hospitalized at the time the study ended. The mentally ill are victimized in many ways besides by violence. One has only to look at the systemic problems in Ohio with guardianship abuses, incarceration, homelessness, and so on to see just how widespread the victimization is. They are victims of a failed system. Mr. Jaffe, however, only cites physical violence as being victimization, so it is hard to compare apples to apples. Though I agree with Mr. Jaffe’s rebuttal to this concept, he proceeded to tie it to something else, with which I cannot agree. He seeks to take vital resources from other organizations and funnel them to programs serving the most seriously mentally ill. Funding one level of care at the expense of another is not a sensible solution to the issue of helping mentally ill people achieve long-term stability. Again, mental illness is a spectrum, not just the extremes of acute crisis and perfectly well. I sincerely doubt Mr. Jaffe would propose taking resources from a wide variety of physical health services and funding only intensive care units. Again, I am certain that someone, somewhere, has said this. There are extremists in every cause, but this is not the belief of any mainstream mental health movement that I have found. We know not everyone can recover. We’ve attended the funerals of our peers, hugged the parents whose children have died by suicide, and watched others struggle day in and day out. Hopefulness, encouragement, and dedication to wellness do not mean we’re blind to the fact that some folks don’t make it. I found it disconcerting that Mr. Jaffe tended to “cherry pick” data from studies to support his conclusions, even when the study itself did not support his views. Additionally, I noticed instances of tying together quotes from multiple studies, research papers, reports, and interviews to “prove” his conclusions (as shown in Myth #5). Just as troublesome is that Mr. Jaffe bases a lot of his conclusions on interviews with 76 AOT recipients in New York City. He references these often on his website, while giving the impression they are different sources. But an interview sample of 76 people in one city is not representative for use in drawing scientific conclusions that have ramifications across the entire country. Overall, I strongly suggest that a person read each citation Mr. Jaffe provided to see what they truly say. Mr. Jaffe does quote a variety of sources, but by using multiple studies, reports, and citations and cobbling them together, a person can “prove” just about anything. Gabe Howard is a public speaker, mental illness advocate, blogger and writer who uses his lived experience with severe mental illness to motivate others and spark change. In 2003, Gabe was diagnosed with bipolar and anxiety disorders after being admitted to a psychiatric hospital. He and his wife make their home in Columbus, Ohio.